These men and women found their entrepreneurial spirit, surmounted business challenges, completed the entrepreneurial process and became successful entrepreneurs. 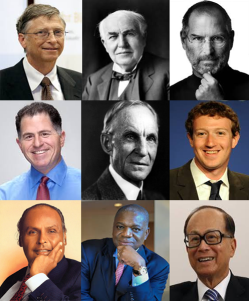 List of these famous Billionaires and Successful Entrepreneurs left to right in image. 1. Bill Gates: Co-founder of Microsoft Corporation, the world largest software company. Dropped out of Harvard to focus on building Microsoft. 2. Thomas Edison: Thomas Edison was labeled dumb and scatterbrain by his school teachers and founded General Electric. One of the most powerful companies in the world. 3. Steve Jobs: Billionaire co-founder of Apple Inc and Pixar. Dropped out of Reed College to start Apple. 4. Michael Dell: He dropped out of college at the age of 19 to start PC’s Limited. Later renamed Dell Computers Inc. Dell became the most profitable PC manufacturer in the world making Michael Dell a billionaire. 5. Henry Ford: This auto-mobile billionaire was born in abject poverty. He never saw the four walls of school but he went on to build Ford Motor Company and become one of the richest men that ever lived. 6. Mark Zuckerberg: The youngest billionaire in the world, dropped out of Harvard to promote his social networking platform; Facebook. As at 2010, he was 23 years and worth $4 billion. 7. Dhirubhai Ambani: Famous founder of Reliance Group. He Started Reliance Industries from scratch and never saw the four walls of school. 9. Li Ka Shing: Billionaire owner of Hutchinson Whampoa. One of the largest conglomerates in Hong Kong, with operations that span over fifty countries and more than 220,000 staff worldwide. Dropped out of school at the age of 15 and started out by selling watch bands.